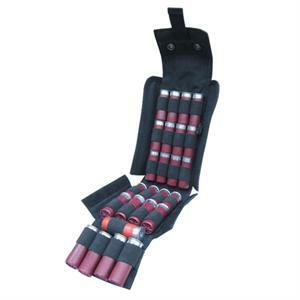 The Condor Outdoor Shotgun Ammo Pouch holds 25 12-gauge rounds securely in elastic webbing. Keep your reloads safe and dry while on the move and reload from your pouch when needed. Mount a couple of these babies on your Tac vest and you're ready for entry duty or close quarter combat. You can snap them into place on your any chest rig, belt, pack or other MOLLE compatible gear as well. Fully compatible any U.S. Military Style (M.O.L.L.E.) gear. Pouches will keep all your gear protected at the ready. Can be placed on the vest and are held in place with attached reinforced snap-straps. Pouches also have straps that accept A.L.I.C.E. clips so they can be worn with A.L.I.C.E. gear, pistol belts, etc. Available in Black, O.D., Coyote Tan, Multicam or Army Digital.